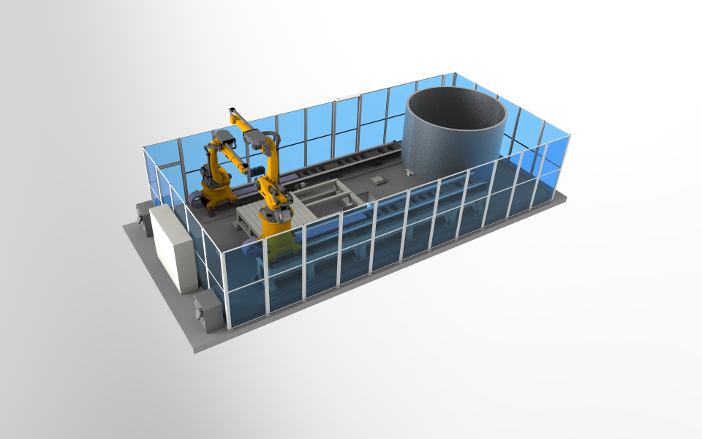 The Intacom program is a series of projects based on the development of robotic inspection systems that is being led by research organization TWI’s Advanced Non-destructive Testing Centre in Port Talbot, South Wales. The program aims to reduce the cost of inspection of complex geometry components for the aerospace industry. The first Intacom project was completed in November 2014 and was funded by TWI, Bombardier, GKN and Rolls-Royce with support from the Welsh government. 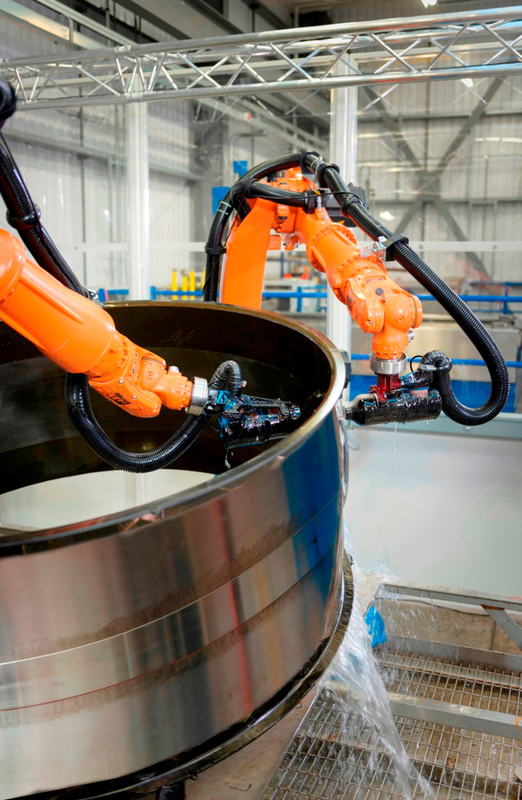 The resulting system was a prototype automated inspection cell which uses two 6-axis robot arms to inspect highly curved components in a fraction of the time usually taken by existing systems. The Intacom system incorporated highly advanced ultrasonic testing technology, developed in-house at TWI, to provide 3D imaging of parts that in many cases could not be inspected in any other way. The industrial partners consequently funded a follow-on project that developed solutions for other components using the existing cell. The innovation at the heart of Intacom lies in two areas: firstly, the use of advanced phased array ultrasonic testing coupled with rapid communications between the robot controller and the ultrasonic system. This allows very rapid area coverage not achievable with single element ultrasonic based systems. Furthermore, the use of advanced focal laws coupled with innovative end-effector designs enables the rapid scanning of difficult areas of geometry, such as tight radii – this would previously have required time consuming and error prone manual inspection. Traditionally, inspectors would mark flaws directly on the surface by hand, and then transcribe the information into reports using photographs or sketches of the area. The Intacom system uses 3D imaging to display scan results together with CAD imagery of the part, making the analysis of the data faster, more intuitive and less prone to errors. Flaws can be imaged not only on the surface as with other systems, but also shown located within the structure of the part. Full waveform ultrasonic data is captured, allowing analysis to occur after scanning is complete without the need for the part to be present, and produces a complete record of the inspection that is archived for future use. This means that other parts can also be scanned whilst analysis of the results is taking place. A suite of analysis and measurement tools enable the flaws to be characterized, located and sentenced without the need to produce drawings or photographs. Intacom is currently configured for ultrasonic testing using phased array transducers, but it could also be adapted to other methods such as thermography or eddy currents. Intacom in this original form has exceeded the “four times faster inspection” target set by the partners, achieving a level at which inspections can be completed, on average, nine times faster than with other systems currently in use. In some cases, it has provided an inspection solution where none existed previously. In 2016, with a view to building on the success achieved by the programme up to that point, the industrial partners from Intacom asked TWI to develop a much larger system in order to address the challenges associated with the inspection of much larger aerospace components such as spars, wing skins and engine casings. A three year project was launched to deliver such a cell, containing much larger robots and additional axes such as 14m (46ft) tracks and a 4m(13ft) turntable. Groundwork is currently underway to reinforce the laboratory floor at TWI Wales, so it can cope with the significant forces that such a fast, large system will produce. The new system is expected to be fully installed by early 2019. In order to maintain positional accuracy over such a large area, and to cope with variability in part shape and positioning within the cell, a combination of metrology systems is being developed. Laser line scanners are being deployed to generate surface profiles of real parts where CAD data is not available or does not sufficiently match the final part shape. A photogrammetry system using eight waterproof cameras is being used to monitor robot position and track movement, enabling any deviation from the intended paths to be identified and providing the option to make real time adjustments to the scan paths. This is particularly important when scanning using ultrasound in through transmission mode, where sound is passed through the part from one robot to the other. Here the relative positioning of the robots is critical, particularly when part surfaces are not parallel and require complex scan paths, and the robots do not simply mirror each other’s movements. A perhaps surprising, but welcome addition to this mainly aerospace partnership is the charity the Royal National Lifeboat Institution (RNLI), which operates lifeboats in the UK’s seas and waterways. The challenges of inspecting a large boat hull are similar to those found when inspecting a wing skin or other large curved surface. But the difference is that the use of a large fixed cell, such as that used for aerospace parts manufacture, is not suited to inspection for manufacture in boatyards or for through life monitoring. However if an appropriate system is developed for on-site inspection, it would also provide a solution for aerospace maintenance inspections. As a result we are now investigating the use of our photogrammetry system to develop a self-calibrating mobile cell that can track the position of any manual or automated inspection system as it moves across the structure. Initial trials on samples of hull structure are very promising and work is ongoing to integrate the Intacom 3D imaging software. Lastly, and looking at the bigger picture, the Intacom program has directly created additional, high quality employment within the South Wales area of the UK. The critical mass of expertise and advanced equipment, coupled with cooperation with local universities, has generated a rapidly growing structural integrity research hub in South Wales that is attracting new business and generating income to the area. The Intacom program is part of TWI’s Advanced Engineering Materials Research Institute, which is aiming to create a significant increase in research capacity in Wales along with new highly skilled, professional jobs. Written by professor Ian Cooper, technology fellow, advanced NDT, TWI. Ian is a Chartered Engineer with over 30 years’ experience in non-destructive testing (NDT). He specializes in NDT of composites, and his recent work has concentrated on advanced NDT methods and automated robotic inspection systems. 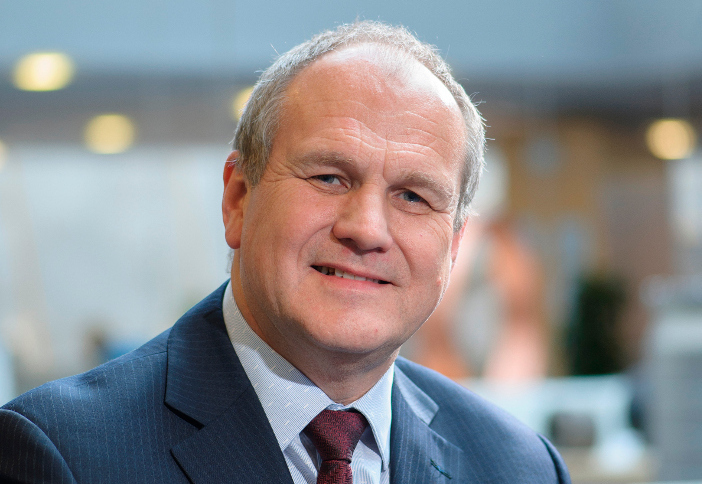 He is a vice president, and a fellow, of the British Institute of Non-Destructive Testing (BINDT) and is Chair of the organisation’s NDT Technical Committee. Ian is also active on a number of committees that guide the development, application, training and certification of NDT.